We are capable of producing a wide variety of drug forms, including tablets, capsules, granules and dry syrups, syrups, and folded powders. Customers can also select from our wide selection of granulation and coating methods. Production of products with high added value is also available, such as oral disintegration tablets and UV laser marking on tablets. Lately, we have also started contract manufacturing of anticancer drugs and other highly reactive agents. 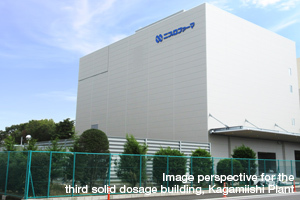 Isolated dedicated buildings for the production of highly reactive agents. Because highly reactive agents contain raw materials that have strong potency at small amounts, various risks result from the shared production of highly reactive agents with other drugs. To reduce these risks and to guarantee safety of the workers we use high containment technologies and make the buildings completely isolated. 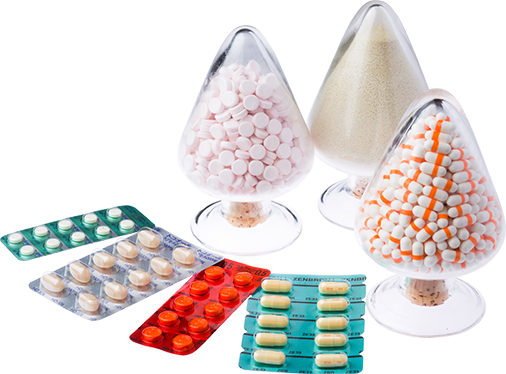 We are capable of producing a wide variety of drug forms, including uncoated tablets, film-coated tablets, oral disintegration tablets, sugar-coated tablets, sustained release tablets, hard capsules, powders and granules. In accordance with the characteristics of drugs, we are also capable of all types of granulation methods, such as wet, dry, extrusion, stirring, rolling bed, fluidized bed, and etc. We can also make suggestions concerning the development and production of oral disintegration tablets for products with high added value. 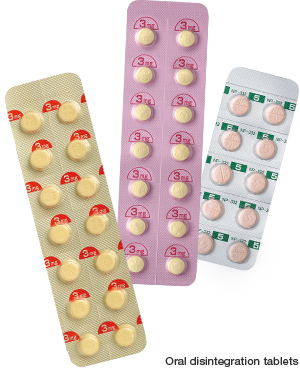 We have a proprietary production technology for oral disintegration tablets that disintegrate with saliva or a small amount of water, and are therefore easy to administer to infants or persons with dysphagia who have weak swallowing power. We support the merchandising of oral disintegration tablets for existing drugs utilizing this technology. We can also produce enteric drugs and sustained release drugs, using our DDS technology for controlling the release speed of drugs.